**SALE+FREE SHIPPING** Normally $450/case, NOW $329.95/case. BEST PRICES IN THE COUNTRY! HEVI-X is a tungsten based waterfowl load. Compared to steel shotshells, HEVI-X™ is “Deadlier at Distance”, giving you 35% more knockdown power at 40 yards and 50% more knock down power at 60 yards. 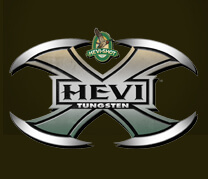 HEVI-X™ gives you higher pellet count on target, higher down range velocity, and more consistent patterns than steel. There is nothing like HEVI-X™ on the market. "Hevi-X - Hey......I didn't come this far to miss!" **SALE+FREE SHIPPING** Normally $450/case, Now $329.95/case! BEST PRICES IN THE COUNTRY!